What is Anthill? It's a business magazine. What’s it about? It's about innovation, entrepreneurship and rapid business growth. 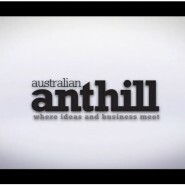 Until Anthill was launched in September 2003, the bulk of existing business titles in Australia were mainly concerned with issues of relevance to small/micro businesses or large corporations (one or the other). Anthill was developed to bridge this gap, appealing to highly innovative and ambitious ‘fast’ growth businesses - SMEs with rapid growth potential and larger companies that realise the value of reinvention to stay ahead. It does not focus on the traditional ‘nuts and bolts’ of business development (although this is a key element of editorial content), but instead it highlights the inspiring thrills, spills, trials and tribulations of business development and rapid commercial growth. Business can and should be fun, right!